Yesterday was our Bay Area Modern (BAM) holiday party. It's a sew day, potluck, gift swap, and meeting with show and tell all wrapped into one. It was such a lovely day after a stressful week. Our theme for this year's holiday swap was B is for BAM. The signup form had a variety of B items you could make (box, bag, bucket, bin, baby blanket, bowl, bookmark, etc.) in a variety of B colors (blue, beige, black, berry, blue-green, blueberry, brown, etc... including an option for "BAM-Maker's Choice"). Joelle chose blue or bright for her color and didn't indicate any item preferences. The gift I made for Joelle was a pair of boxy trays. I've seen these around a ton and don't know who the original designer is, but I used the "just wing it" technique for making mine. Sometimes having too many options can be paralyzing. Once I decided what item I would make I pondered what fabric to use. 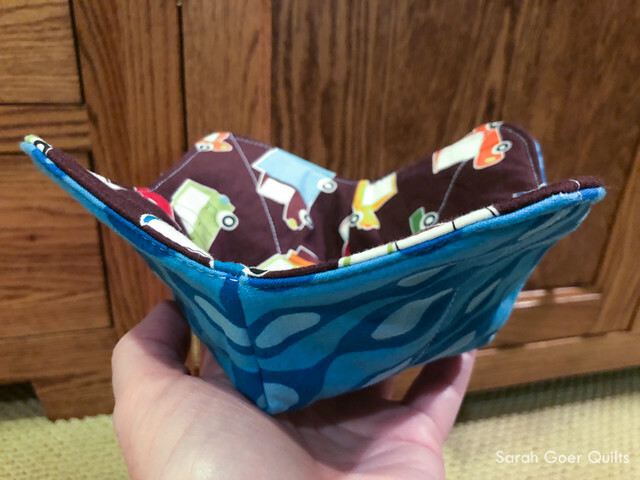 Then I noticed my leftover pile of fabric from my Fandangle Scrappy Squares quilt. I love the bold blue and green colors in this line. And if it didn't seem perfect enough, I had leftover squares of fabric already cut. 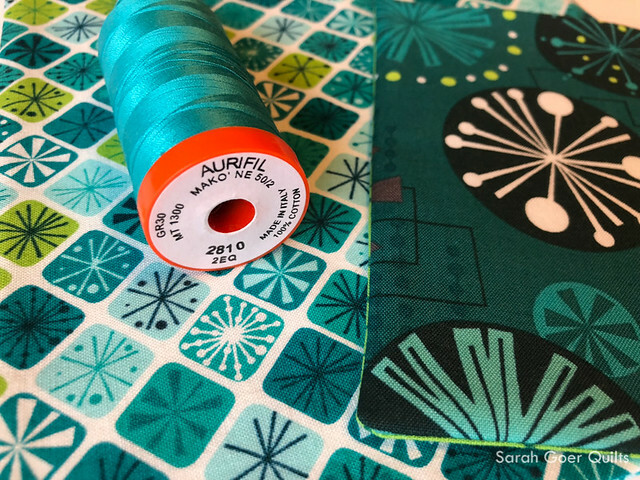 And I had the perfect thread color (Aurifil Turquoise) for top stitching. 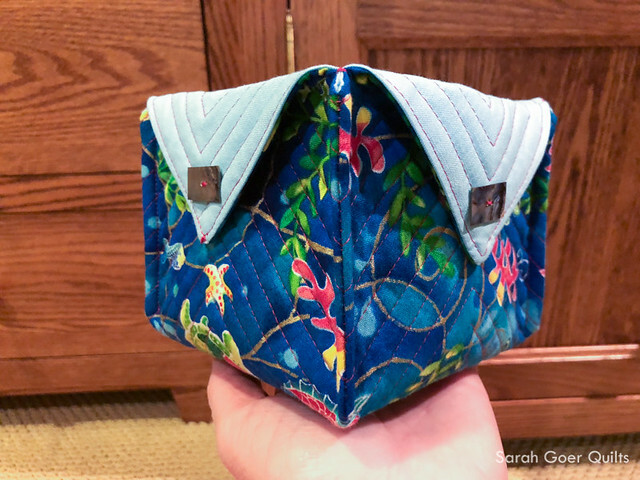 The project I brought to work on at the meeting/party was actually my Fandangle quilt which I was sewing a quilt sleeve onto. Joelle stopped by the table I was working at and admired the fabric while I was working. 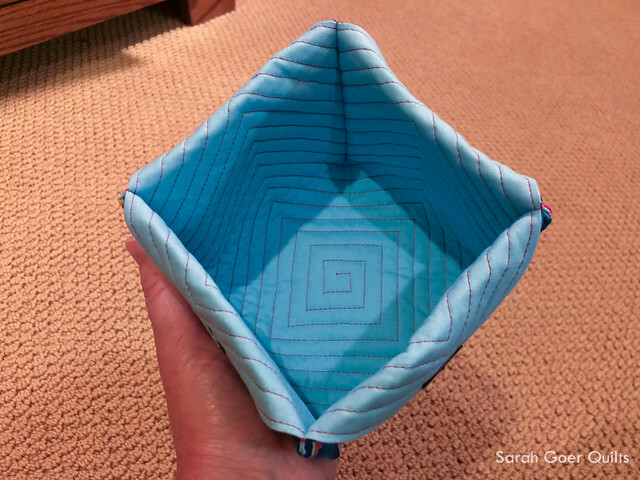 :-) When she opened her gift she noticed that I had used the same fabric for her trays. Oh, and I like wrapping gifts for quilters in fabric. I received a lovely gift from Cyndi for the holiday swap. She was so generous to make not one, but four items for me! My daughter is attempting to claim two of them, but I'm trying to stand firm. ;-) However, the little fish bin would be lovely in my daughter's room. Hm. 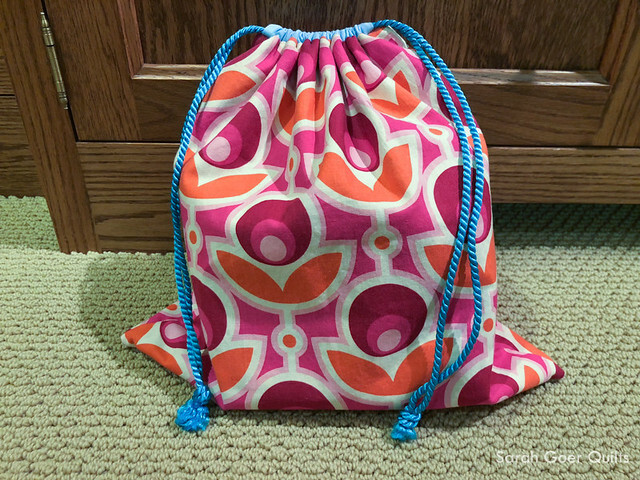 First is this beautiful, bright drawstring bag. I really love hot pink and love the bold print on the fabric. Inside that bag was the adorable quilted bin. Look at the lovely buttons she used to adorn it! And I love the spiral quilting. Inside the bin was a little pouch and a bunch of delicious chocolate caramels! And lastly, the bag also contained this microwavable fabric bowl. I've never had one of these, but think it will be a great addition to the kitchen. Yesterday, I also received a swap gift for the Mini + Metal swap. 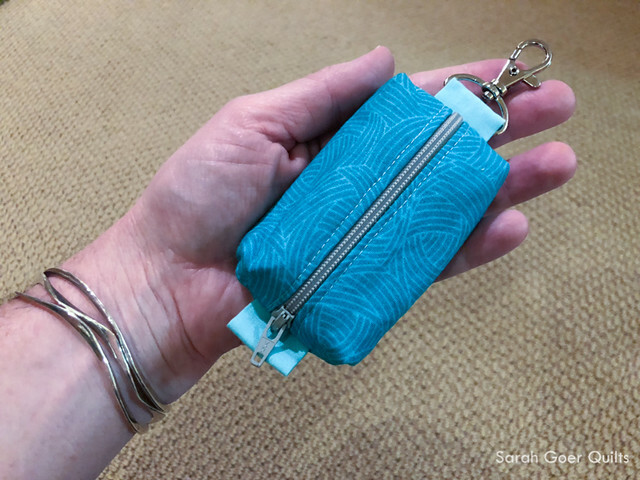 Back in September I shared the extra small open wide zippered pouch that I made to give in that swap. I didn't receive my gift that month, and then I missed the October and November meetings. 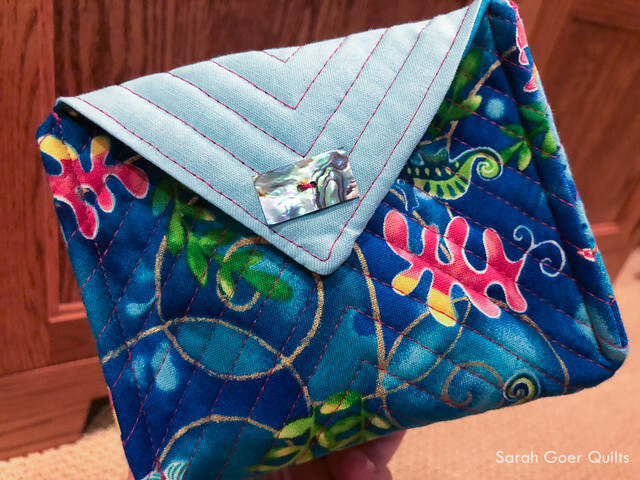 Sue delivered my adorable, aqua pouch. 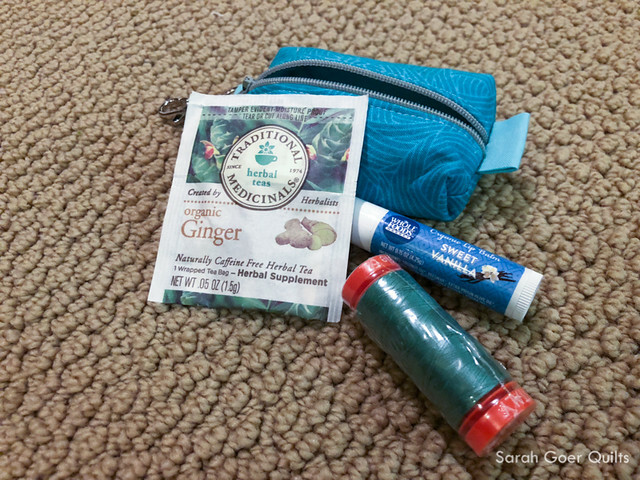 And she stuffed it full with a spool of Aurifil, chapstick, and a bag of tea. 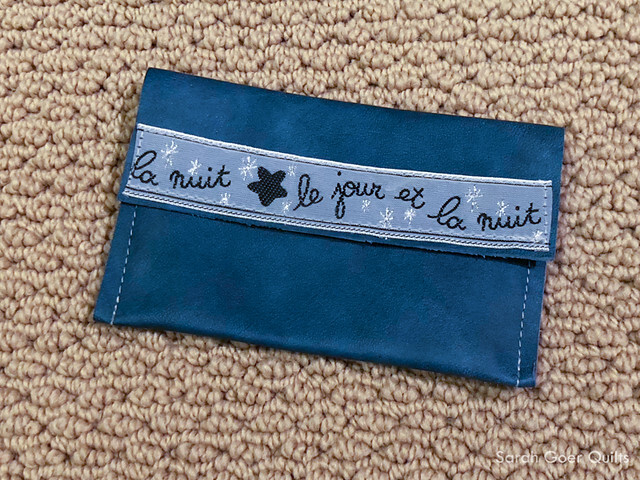 I think this little bag is destined for my purse. It will make me smile every time I see it. Posted in Quilting. 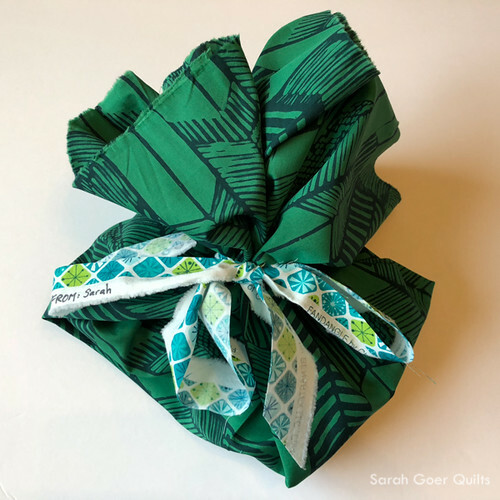 Tags: fabric bag, fabric box, swap gifts on December 2, 2018 by sarah. 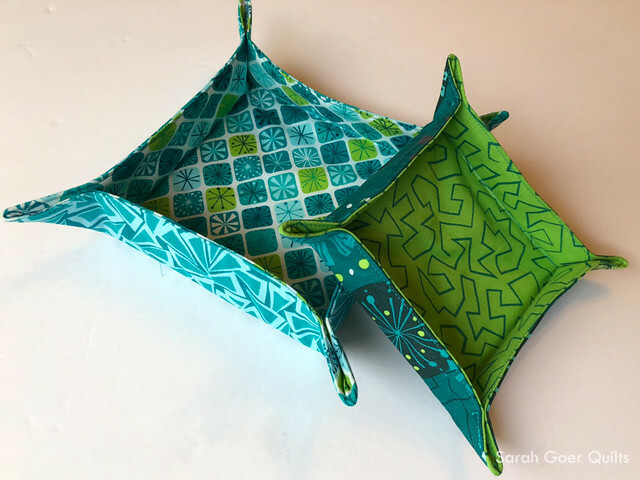 I love the serendipity of Joelle admiring the Fandangle fabric and then receiving the gift from you later made with it as well, how perfect is that!? It made me smile. 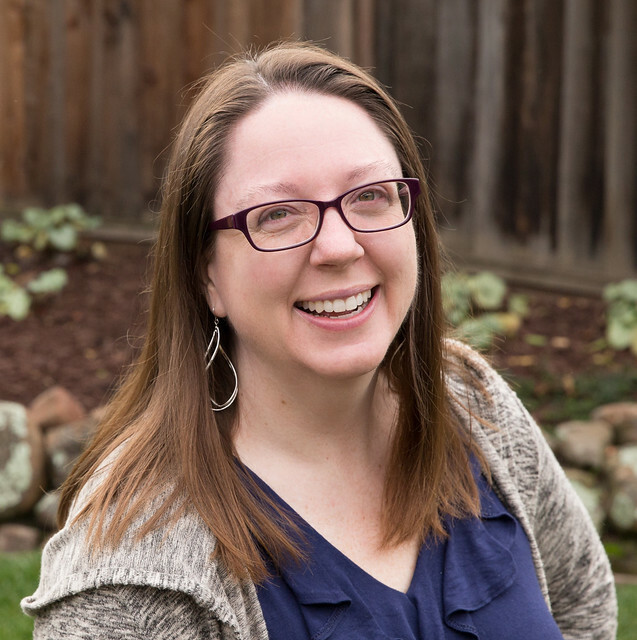 :-) Thanks for visiting, Yvonne. There's so much goodness in this post. The fabrics.....such great colours and great prints.